Brighten up the holiday by having the kids make cards to give to family and friends! Kid-made cards are one of the best gifts to give this Christmas season. 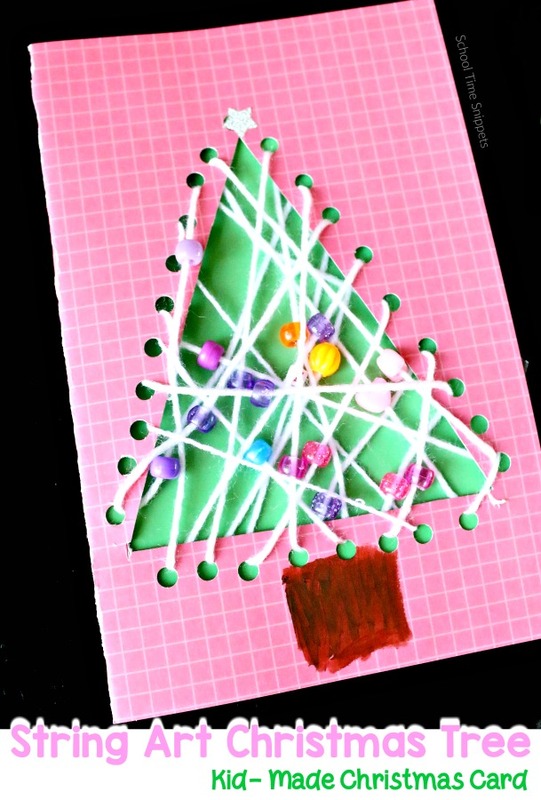 Spread some holiday cheer with these string art for kids Christmas cards! These kid-made cards are fun, colorful, and a great way to keep the kiddos busy over holiday break. My kids are big fans of creating, so why not put that creativity to use by having them make Christmas cards to gift to others during this holiday season? These Christmas cards for kids are fun to make-- you may end up with enough for several family, friends, and/or neighbors. 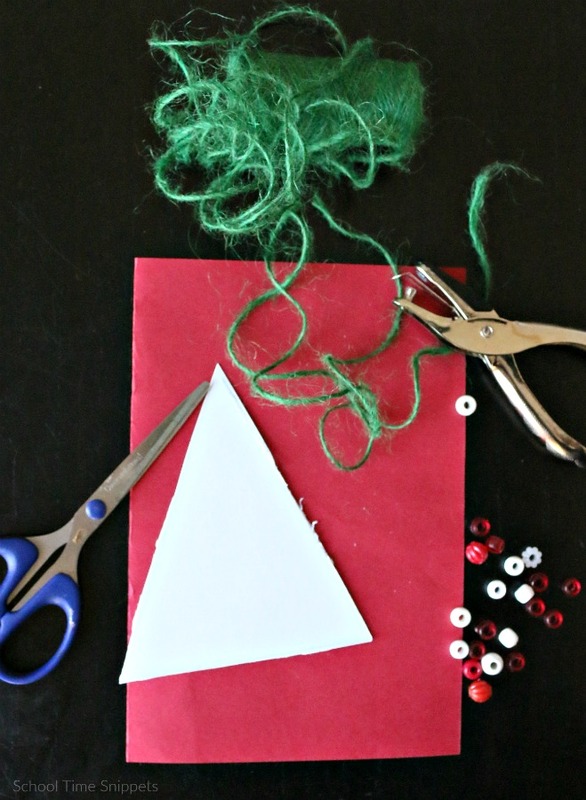 We are also big fans of yarn and string crafts, thus was our inspiration for these kid made Christmas cards! 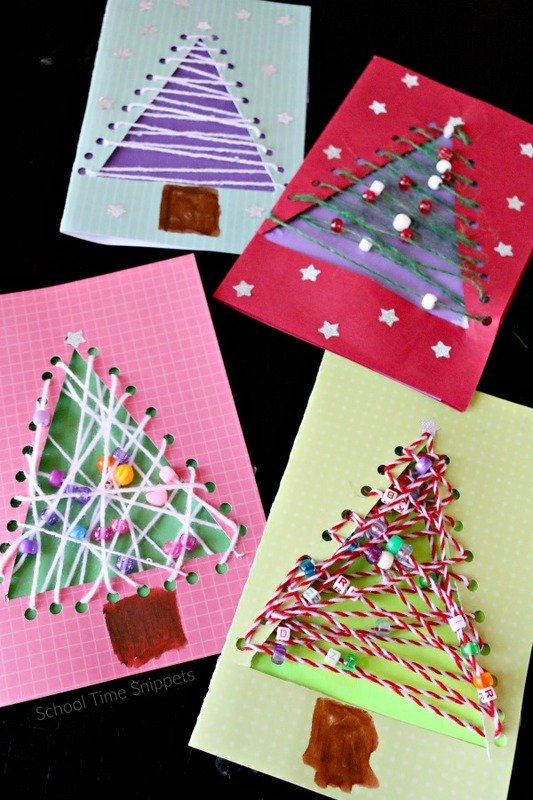 Using many materials we had around the house, my kids made several String Christmas Tree Cards! Fold a piece of cardstock in half to form a card. 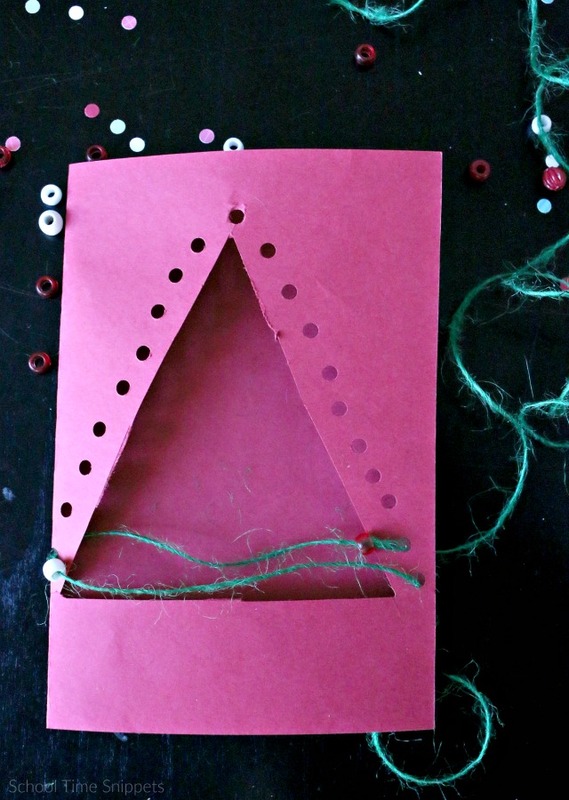 Open the card and on the inside, draw a triangle shape that will become the string tree. 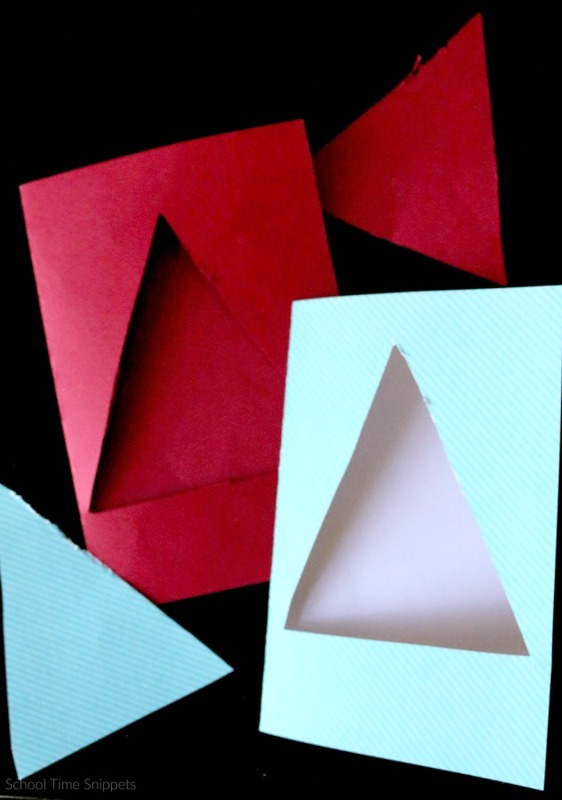 It may be helpful to create a triangle template from another piece of cardstock. 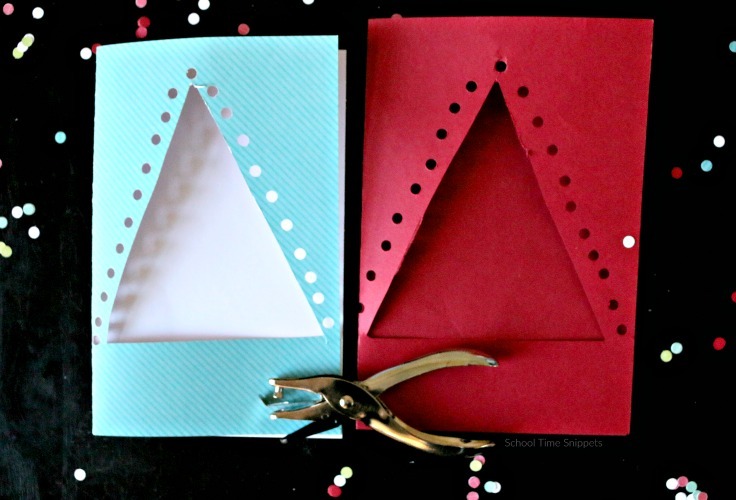 Using an X-acto knife or the tips of the scissors, cut out the triangle shape from the cardstock. You may have to trace over it with something sharp, and then insert the scissors to cut the rest of the shape. Next, take hold punch along the edge of the triangle shape. Be careful not too get too close to the edge of the triangle. You may wish to measure out how far apart you want your holes to be, but we did not. Take your chosen color of string and begin lacing it through the holes. If you wish to add beads, thread a bead onto the sting before lacing the string through a hole. Choose to lace the string in a zig-zag pattern, horizontal back and forth, or at random! Tape the ends of the string to the inside of the card. 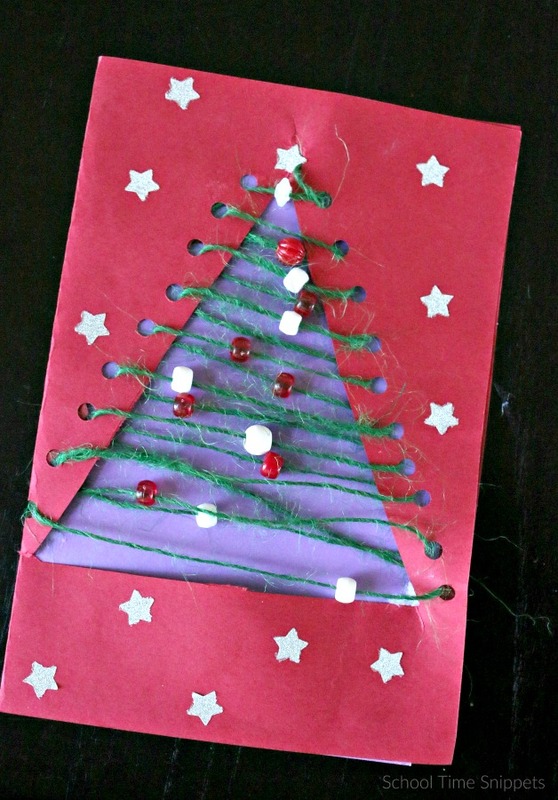 To add a POP of color, glue another piece of cardstock on the inside of the card- covering the string tree. Finally, add embellishments if you wish to decorate around the string tree! On the inside of the Christmas card, write a special little message. 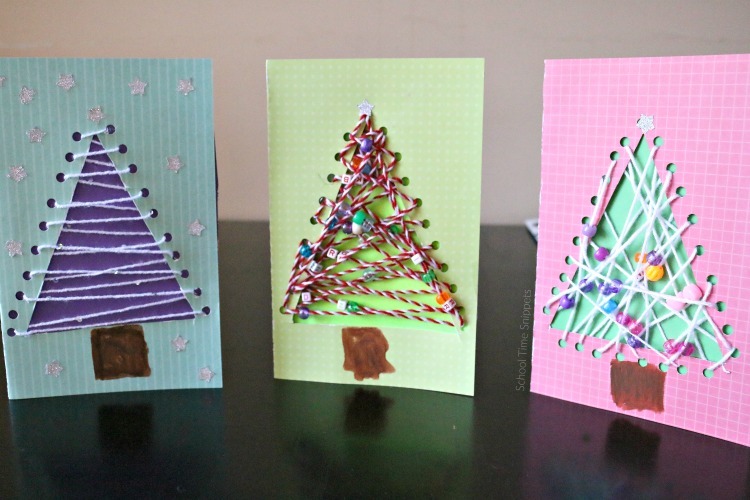 These string tree Christmas cards for kids to make turned out lovely!! Here's a picture of 4 of the 5 cards. My kiddos can't wait to gift them to family and friends! Tip: Make sure to use cardstock for this Christmas card. The card will be sturdier. The string tree will hold tighter... it will give a nicer look all around. Hope enjoyed this Christmas card tutorial for kids! Visit Teach Me Mommy for more awesome Kid-Made Christmas Ideas! 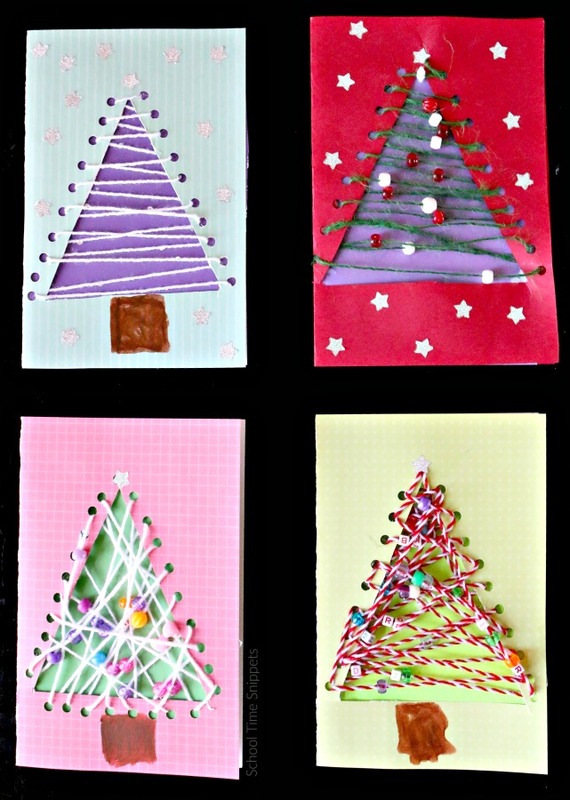 4 comments on "String Christmas Tree Card for Kids to Make"
That is so pretty and good for fine motor skills too! Thanks for sharing it during our Kid-made Christmas . series! Yes! Wonderful way to sneak in more fine motor work! We are also huge fans of yarn, wool and string crafts. This is just perfect! I love how unique and colorful your cards look.